Trickle irrigation (also known as drip irrigation) system comprises main line (37.5 mm to 70 mm diameter pipe), submains (25 mm to 37.5 mm diameter pipe), laterals (6 mm to 8 mm diameter pipe), valves (to control the flow), drippers or emitters (to supply water to the plants), pressure gauges, water meters, filters (to remove all debris, sand and clay to reduce clogging of the emitters), pumps, fertiliser tanks, vacuum breakers, and pressure regulators. The drippers are designed to supply water at the desired rate (1 to 10 litres per hour) directly to the soil. Low pressure heads at the emitters are considered adequate as the soil capillary forces cause the emitted water to spread laterally and vertically. Flow is controlled manually or set to automatically either (i) deliver desired amount of water for a predetermined time, or (ii) supply water whenever soil moisture decreases to a predetermined amount. A line sketch of a typical drip irrigation system is shown in Fig. Drip irrigation has several advantages. It saves water, enhances plant growth and crop yield, saves labour and energy, controls weed growth, causes no erosion of soil, does not require land preparation, and also improves fertilizer application efficiency. However, this method of irrigation does have some economic and technical limitations as it requires high skill in design, installation, and subsequent operation. widely spaced plants without wetting the soil where no roots exist. In arid regions, the irrigation efficiency may be as high as 90 per cent and with very good management it may approach the ideal value of 100 per cent. The main reasons for the high efficiency of trickle irrigation are its capability to produce and maintain continuously high soil moisture content in the root zone and the reduction in the growth of weeds (due to limited wet surface area) competing with the crop for water and nutrients. Insect, disease, and fungus problems are also reduced by minimising the wetting of the soil surface. considerable moisture at the time of harvesting (such as tomatoes, grapes, berries, etc.) respond very well to trickle irrigation. However, this method is not at all suitable (from practical as well as economic considerations) for closely planted crops such as wheat and other cereal grains. organic growth. In trickle irrigation, only a part of the soil is wetted and, hence it must be ensured that the root growth is not restricted. Another problem of trickle irrigation is on account of the dissolved salt left in the soil as the water is used by the plants. If the rain water flushes the salts near the surface down into the root zone, severe damage to the crop may result. In such situations, application of water by sprinkler or surface irrigation may become necessary. with the drip irrigation, India has embarked on a massive programme for popularising this method. The area under drip irrigation in India is about 71000 hectares against a world total of about 1.8 million hectares (6). The area coverage is the highest in Maharashtra. (about 33000 hectares) followed by Andhra Pradesh and Karnataka. Cost of drip irrigation system in India varies from about Rs. 15000 to 40000 per hectare. 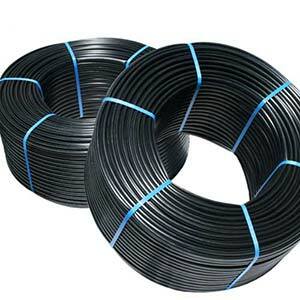 The benefit-cost ratio (excluding the benefit of saving in water) for drip irrigation system varies between 1.3 to 2.6. However, for grapes this ratio is much higher and may be as high as 13. The water applied directly infiltrates into the soil irrigating the root zone influence through a piping system and emitters. These issuers offer a fixed rate within a more or less wide pressure range. The usefulness of these emitters is the ability of homogenization irrigation along an irrigation line as the last emitter line typically have a lower pressure than the first because the pressure drop due to friction of water with pipe. These droppers are automatically closed when lowering the pressure in the irrigation system so that no discharge pipe occurs, resulting in benefits such as preventing the entry of air into the system and irrigation pump does not need to load the system to start operating, thereby optimizing their use. They can regulate the flow with a mechanical control. 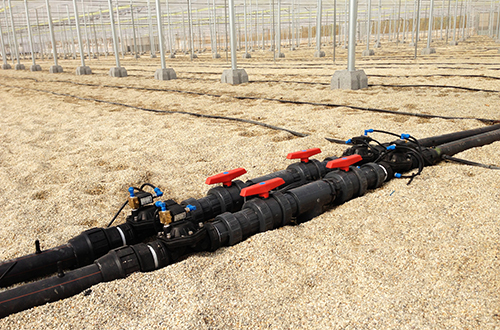 The use of drip irrigation systems are widely used in fruit, citrus, vines and vegetable crops, especially in temperate areas with scarce water resources. Pump assembly: to provide the appropriate pressure and flow rate to the facility. Filtering:: the varying degrees of thickness thereof filtration anger related water quality, and the size of the sprinkler nozzle. Porta issuer Pipes: flow and spacing between them will depend on the crop in question and the characteristics of the soil where you are. Allow get water to drip with the flow, pressure, cleaning and concentration of nutrients required. They are responsible for transporting water with fertilizers.. They are pipes with the corresponding drippers carries emitters that enable downloading flows established. Installing porta issuer PE pipes and fittings.